Shortly after the horrific attacks on 9/11, it was discovered that there was an American plan to dismantle the regimes of seven countries: Iraq, Syria, Lebanon, Libya, Somalia, Sudan and lastly, Iran. Since then, the world witnessed regime change and subsequent civil wars in Iraq and Libya while Somalia and Sudan remain failed states. However, Iran, along with its close ally, the Lebanese Hezbollah, which is said to be stronger than the Lebanese army and the most powerful non-state armed actor on earth, remain not only fully functional but have in fact expanded their power vis-à-vis the United States, Israel and their Gulf Arab governments. US-Israeli-Saudi efforts in the Middle East since 2001 have provided multiple instances of Blowback—long term, unintended negative consequences of foreign policy. Nowhere is this more telling than Iran’s expanded and still growing influence in the region as the result of American missteps. Rather than converting Iraq into a launching pad to effectuate regime change in Iran, the United States saw Iranian influence and control grow in Iraq. Rather than meeting its declared mission of knocking out the Lebanese Hezbollah in 2006, Israel suffered its third defeat at the hands of the Iranian ally. In Iraq’s quest to rid its country of ISIS fighters, one Iranian official joked that the Iraqis prefer to have Iranian commanders lead from the front rather than American advisers direct them from the rear. Relatedly, world opinion generally credits Iranian Revolutionary Guard General Qassem Suleimani, rather than any American, Israeli or Saudi counterpart, as the one who led the successful campaign against ISIS in Iraq. Instead of giving up its quest for regime change in Iran, the United States, Israel and Saudi Arabia appear to be more determined than ever. Instead of giving up its quest for regime change in Iran, the United States, Israel and Saudi Arabia appear to be more determined than ever. Evidence for this is found not only in Trump’s withdrawal from the JCPOA and imposition of harsh sanctions against Iran, but also in the mainstream media’s bias in reporting on Iran. Rather than analyzing the obvious drawbacks in pursuing regime change in Iran (e.g. the expected high loss of human life, enormous cost to the American taxpayer and resulting chaos in what would in all likelihood result in a fragmentation of the country similar to that of Syria and Libya), the mainstream media curiously appears to favor a regime change policy. While this may initially appear to be surprising, identifying the many groups that would benefit from regime change in Iran quickly harmonizes the disparity between facts and reporting. Saudi Arabia and Israel would greatly benefit from Iranian regime change, as it would eliminate their chief rival in the region. The notorious terrorist cult organization, Mujahedin-e Khalq (“MEK”) would be a likely beneficiary, as it would clear the way for them to achieve their goal of acquiring power in the country (an objective that they failed to achieve after the 1979 revolution). Simultaneously, Crown Prince Reza Pahlavi (the would be ruler of Iran but for the 1979 revolution) of the Pahlavi family would potentially be able to return to some sort of a leadership position in the country. The neoconservative establishment in the United States that infamously brought us the toppling of Saddam Hussein in 2003 and subsequent brutal aftermath would stand to benefit, as regime change in Iran was their ultimate goal (“Anyway can go to Baghdad. Real men go to Tehran.”). One must recall that the neoconservatives sought a fairy tale scenario wherein the fall of Baghdad would lead to the rest of the Middle East (Iran included) to magically turn into pro-American liberal democracies. The goal of removing the clerical regime in Iran is apparently so powerful that it has united groups that would otherwise hate one another. 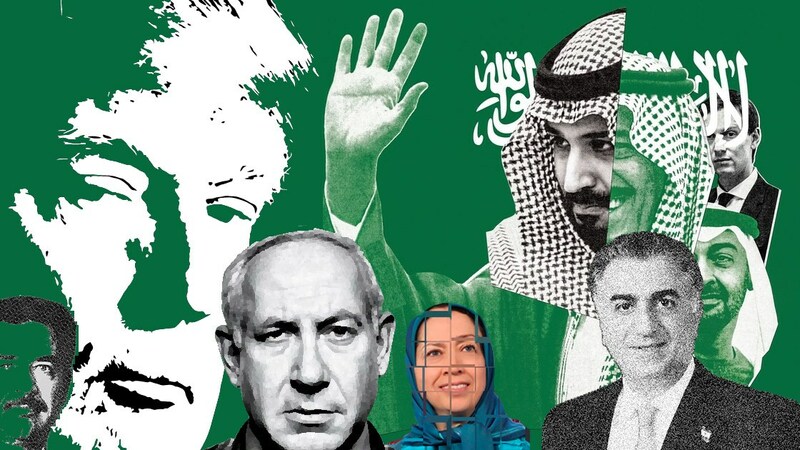 Indeed, absent a hatred of the Iranian regime, there are few commonalities between a Zionist, Saudi royalist, Iranian monarchist, MEK member and a Neocon. Nevertheless, many of these various groupings have found a loose yet committed confederation in their quest for regime change. This confederation has revealed itself in the mainstream media’s bias against Iran. One manifestation of this trend is witnessing how the MEK was somehow transformed from a terrorist organization to a dissident Iranian organization after only a short time. This transformation from terrorist to dissident just so happened to occur after the MEK’s base in Iraq was sacked (the MEK had been an ally of Saddam Hussein) and the calls for regime change in Iran grew louder. That the mainstream media belongs to only a handful of large corporate entities is another fact to consider. What this means for pro-regime change groupings is that there are relatively few sources that must be purchased to create an echo chamber favoring their political agenda. What is more, it is odd that Persian language outlets such as Voice of America, Manoto, Kalameh and Radio Farda consistently and persistently appear to favor regime change despite so many obvious policy drawbacks. …it is important to expose media outlets that receive funding from the Israeli government, Saudi Kingdom, MEK, Pahlavi family and neoconservative groups. In light of the above, it is important to expose media outlets that receive funding from the Israeli government, Saudi Kingdom, MEK, Pahlavi family and neoconservative groups. This will reveal important biases to alert the public of another American foreign policy misadventure that will dwarf the carnage of Operation Iraqi “Freedom. That the MEK and Pahlavi family seek regime change in Iran should come as no surprise. Both organizations adamantly feel as though they are the true rulers of Iran and that they were unjustly pushed out of power by the current regime. However, it is important to identify the geopolitics behind the Saudi-Israeli-US alliance against Iran to put the issue in its proper context. This is especially so as Saudi Arabia and Israel (along with their respective lobbies in the United States) face an uncomfortable reality: Iran’s status as an ethnic minority in the region, important strategic position, natural resources, large economy, powerful military and significant influence in the Middle East make Iran a much better geopolitical ally to the United States than both Israel and Saudi Arabia combined. The U.S-Saudi relationship dates back to the 1940s wherein the United States essentially committed to protect the Saudi Royal Family in exchange for cheap oil. American commitment to this doctrine was subsequently reinforced in the Nixon and Carter Doctrines. Any attempt by any outside force to gain control of the Persian Gulf region will be regarded as an assault on the vital interests of the United States of America, and such an assault will be repelled by any means necessary, including military force. The anti-American nature of Iran’s 1979 revolution and the Carter Doctrine turned the United States and Iran from allies to enemies. Indeed, on January 7, 1981, President Carter signed a secret directive authorizing “the Pentagon to use force to prevent Iran from closing the Strait of Hormuz to oil exports.” What is politically ironic but geopolitically not surprising is that President Reagan continued the Carter Doctrine. Since American officials at the time viewed military force as a last resort, the United States required a proxy to enforce the Carter Doctrine. As a result, Reagan administration threw its weight behind Saddam Hussein’s Iraq. The Iran-Iraq war (1980-1988) revealed Saddam Hussein to be an incompetent military proxy for the United States. Throughout the war, American officials expressed repeated anxiety about the Iraqi military’s ability to perform against Iranian advances. Indeed, American aid was crucial to preventing a decisive Iranian victory in the Iran-Iraq war. Saddam Hussein would subsequently prove himself to be a liability. Not realizing that he was merely an American pawn to protect the other Arab governments in the Persian Gulf from Iranian expansion, Saddam invaded oil rich Kuwait. This foolish move invited direct American military intervention in Operation Desert Storm (1990-1991) and severely weakened Iraq’s military. After essentially decimating its regional strongman, the United States was left without a military proxy to check Iranian expansion in the region. While the Cold War was over, American concerns about Iranian influence throughout the Middle East remained. Indeed, President George H.W. Bush generally continued the Carter Doctrine upon his signing of the National Security Directive 26 on October 2, 1989. President Clinton’s lack of foreign policy experience allowed his National Security Advisor, Martin Indyk, a former AIPAC director to dominate Clinton’s Middle East policy. Indyk convinced Clinton to pursue a policy of containment vis-à-vis Iran. Meanwhile, Israel, emboldened by the fall of the Soviet Union, the crippling of Saddam Hussein (an arch nemesis of Israel) and having an ally in the Clinton White House, began to depict Iran as a threat to advance its “New Middle East” ambitions. Israeli Prime Minister’s Yitzhak Rabin’s proposal whereby Israel would play a central role in the Middle East required Israel to demonize the only remaining regional power in the Middle East: Iran. That Rabin’s vilification of Iran flew in the face of Israel supplying Iran with weaponry and lobbying the United States to do so throughout the Iran-Iraq war apparently was of no importance. Utilizing the often repeated but poorly supported myth of Israeli military invincibility, Israel and its lobby in the United States was able to convince the Clinton administration that Israel could replace Saddam as the regional pro-American powerhouse to thwart Iranian influence. Israeli-AIPAC efforts in the United States quickly bore fruit in the anti-Iran campaign. AIPAC successfully lobbied the Clinton administration and subsequently Congress to halt all U.S. trade with Iran despite Israel continuing trade with Iran. This included cancellation of a $1 billion Iranian oil contract with an American company, Conoco. Although the Conoco deal found support in the State Department and CIA, pro-Israeli forces in the United States ended the deal by way of the Iran Libya Sanctions Act. This also served as the third failed attempt by then Iranian Akbar Hashemi President to normalize relations with the United States and therefore emboldened Iranian hardliners. Simultaneously, then Speaker of the House Newt Gingrich publicly secured $18 million for covert operations against Iran while arguing for regime change. 9/11 would considerably raise the stakes. With the rise of neo-conservatism in the United States, the Israeli lobby found a welcoming ear in their quest for regional expansion. The Israel lobby’s role in pushing the United States to invading Iraq is well documented. Iran saw the writing on the wall. Indeed, neo-conservatives were not ambiguous about their ambitions for regime change in Iran. Such voices manifested themselves via official means by way of President Bush’s Axis of Evil speech in 2002 vilifying Iran despite Iran providing the Americans with crucial support in defeating the Taliban in Afghanistan. This resulted in Iran converting its cooperation with the United States in Afghanistan into subversion. Oddly, the United States did not have a concrete plan in place to invade Iran after toppling Saddam. The Bush administration did not conduct war games or simulations on this topic. Nevertheless, Iran offered the United States and Israel the 2003 grand bargain (which has received little attention in American mainstream media) whereby the two countries would normalize relations, Iran would offer full access to its nuclear, chemical and biological tech programs, cooperation on fighting terrorism, assistance in stabilizing post-Saddam Iraq and pressuring Palestinian opposition groups to stop violence against Israel. The proposal even offered to disarm the Lebanese Hezbollah. The Bush administration and Israel instead decided to pursue regime change and rejected the grand bargain. Coupled with American incompetence in stabilizing post-Saddam Iraq (e.g. Paul Bremer’s de-Baathification policy), U.S. and Israeli announcements for regime change convinced the Iranian regime to not only subvert American efforts in Iraq, but to take advantage of the power vacuum that the American invasion created and expand Iranian influence in Iraq. Rather than becoming a launching pad for an American invasion of Iran, post-Saddam Iraq turned into an Iranian ally. Iran’s increased strength and expansion throughout the Middle East pushed Saudi Arabia and Israel closer together. The two countries had always had an unusual alliance. The Saudi Kingdom’s rise to power in the country significantly owes a debt to the British favoring the Ibn Saud family (the current ruling family in Saudi Arabia) over the Hashemites (the would be ruling family in Saudi Arabia). Part of the British preference was due to the Ibn Saud family’s approval of the creation of the state of Israel as per Britain’s Balfour Declaration. Recently, Saudi Royalists and Zionist hardliners have found a common enemy in Iran and decided that it would be convenient to reinforce their alliance. However, the United States, Israel nor Saudi Arabia has the ability to overthrow the Iranian regime by way of overt military force. American military plans in the late 1990s asserted that toppling the Islamic Republic by force would require three years of fighting and at least half a million troops. Such plans and the estimates upon which they were premised were based on circumstances that predated the Iranian regime’s entrenchment in Iraq, Syria and Lebanon. Currently, therefore, it is logical to conclude that the current cost to topple the clerical regime in Iran is much higher. As such, the three countries have resorted to a propaganda war in hopes of weakening Iran and creating the conditions necessary for regime change. On October 31, 2018, the Guardian published an article headlined “Concern over UK-Based Iranian TV Channel’s Links to Saudi Arabia.” In that article, Saeed Kamali Dehghan detailed that a UK-based Iranian TV station is being funded by a “secretive offshore entity” with close links to the Saudi Crown Prince Mohammed Bin Salman (“MBS”). The UK-based Iranian TV station, “Iranian International TV” joined the many exiled Iranian channels that reach Iranian residents by way of satellite television such as BBC’s Persian service and Manoto TV. An insider claimed that the channel had turned into a platform for “ethnic partisanship and sectarianism.” The article went on to identify instances where Iranian International TV provided the MEK a platform and how its parent company, Volant Media has strong links with the Saudi Royal Family. Importantly, Iranian International TV receives no commercial income, which makes its dependence on Saudi funding and corresponding Saudi bias incredibly apparent. This tweet, which was later deleted, did not receive any considerable coverage in American mainstream media. One may argue that Tasnim News and Press TV have a strong pro-Iran and anti-Saudi bias. However, such an argument would ignore the fact that the tweet from Saeed Kamali Dehghan stands on its own regardless of any bias on the part of Tasnim and Press TV. While mainstream American media has provided some coverage on the Khashoggi murder, it has failed to do so within the crucial policy framework of Trump’s pro-regime change stance in Iran. When considered in conjunction with Trump’s November 20th statement pardoning Saudi Arabia in part by demonizing Iran, the above strongly supports the contention that the United States has declared a propaganda war on Iran. That Trump has admitted to having personal business interests (and subsequently denied those business interests when confronted) with the Saudi Kingdom only bolsters the claim. Trump’s decision to cite Israeli interests when defending the U.S.-Saudi relationship only further reveals that there is coordination among the U.S, Israel and Saudi Arabia in this regime change campaign against Iran. In 2017, protests began in one of Iran’s largest cities, Mashhad. The trigger appears to have been dissatisfaction regarding the price of food and necessities. Regime change advocates quickly sought to exploit these protests. Many who agreed with the protestors’ grievances were concerned that external forces like the Pahlavi family and MEK would attempt to leverage what appeared to be reasonable complaints to push for their own goals. Such concerns turned out to be well founded. The Guardian reported on June 30, 2018 that Rudy Giuliani, Trump’s lawyer, admitted that the protests were “happening because of many of our people in Albania.” What is significant about Albania is that it is the location where MEK’s compound is located. On November 9, 2018, the Guardian revealed that MEK’s “main work in Albania involves fighting online in an escalating information war.” This information war included a 1,000 member “troll farm” in Albania that would post propaganda in multiple different languages and multiple different online outlets (including Facebook, Twitter and others). The above was virtually absent in mainstream American media. When read in conjunction with statements by John Bolton (who would subsequently become Trump’s National Security Adviser) at a 2017 MEK rally calling for regime change in Iran by 2019, it is difficult to ignore the Trump administration’s reckless regime change policy in Iran. What is even more troubling is that the Trump administration intends to achieve this goal by using an organization that the Iranian general public sees as synonymous with treason. With respect to why the Iran protests were happening, Giuliani also referred to “many of our people…throughout the world.” On August 4, 2018, the Critics Chronicle revealed that Saudi Arabia paid $300 million to Reza Pahlavi, the Crown Prince of the Pahlavi family and the would be heir to Mohammad Reza Pahlavi’s throne but for the 1979 revolution. This $300 million contract was intended for Reza Pahlavi to promote anti-government protests in Iran. At the writing of this draft, that article is not available online. However, the story was republished in November by other outlets including Tehran Times. Consistent with the overall trend, this story did not appear in mainstream American media. Credible Iran analysts across the world are nearly unanimous in their belief that Reza Pahlavi, like MEK, has little to no support among the Iranian general public. That the American mainstream media would not report that an unpopular figure like Reza Pahlavi received $300 million to promote regime change in Iran cements the contention of an Israeli-Saudi-US information war. Educated at UC Berkeley and the University of Cambridge, Mr. Behnam Gharagozli is a civil rights attorney who has written about issues ranging from the current Iranian regime, the Iranian-Israeli enmity, the law of warfare, Israel’s defeat in the 2006 war in Lebanon and Zionist attacks on activism and scholarship in the United States.